What a brilliant day! I had high hopes for my first battle with Newcastle’s Regiment, but even they were surpassed by the friendliness and camaraderie of everyone I met. Plus the battle felt truly epic -friends who saw the pics said it looked like a movie! I joined up by myself (and didn’t know anyone! ), but was never without people to talk with, and had some great conversations throughout the day. I was loaned pretty much the full uniform, and soon looked and felt every inch the 17th century soldier. The march through the packed town centre made you feel like a celebrity – and even with just basic pike training, I managed to stay in line without dropping it or snagging a telephone wire. 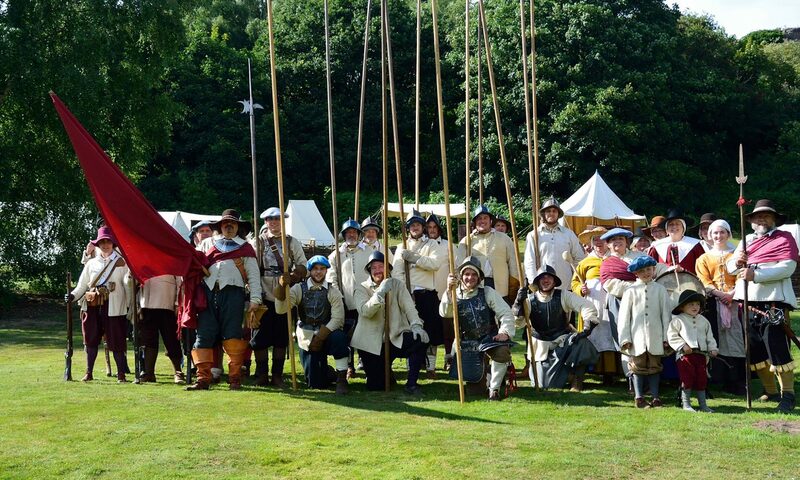 Lining up for battle, with hundreds of reenactors, it was very exciting. Our pike block felt solid and ready for action after marching together. I was very glad for the core of long serving and confident troops. Then it was time to attack – I’ll be honest, I was surprised (but happily!) just how physical the actual fighting was – all bunching up and smashing into another regiment of pikemen, then shoving until one side was pushed back (or someone fell over). The anticipation of the collision, and then shoving or being shoved was like your favourite team sport, but better! Muskets were firing on either side, through the smoke I don’t even remember seeing the crowd. Parliament may have taken the day back in 1644, but we certainly felt like we had the better of it in 2019. In the evening we all went for a meal, and I got a chance to speak with other members who I hadn’t met on the field, or in the pub or town earlier. Everyone was lovely, and it was great to finish the night piled in a hotel room, still chatting – it was like a work Christmas party, but with more interesting people! I have signed up for the year and will go to every event that I possibly can, I have a new best hobby. If you like history, dressing up, team activities, having a laugh and socialising, then you’ll love Newcastle’s Regimente of Foote. Yeah, I still ache 3 days later, and I was ready to play dead after about 40 minutes of back and forth, but I’d do it all again tomorrow! If like Ben, you’ve been thinking about giving re-enactment a go, head to our Joining Us page to find out how to get involved and make being a Newcastle your new venture for 2019.